Crocodile Chemistry is a comprehensive simulated chemistry laboratory where you can model experiments and reactions safely and easily. Drag chemicals, equipment and glassware from the toolbars at the side of the screen, and combine them as you wish. Choose whatever quantities and concentrations you like: reactions are modelled accurately as soon as you mix the chemicals. Plot graphs to analyse data from your experiment, and view mechanisms using 3D animations. The latest version includes 63 lesson kits designed for the new science curriculum, making it much easier to prepare for your teaching. The 63 new lesson kits in Crocodile Chemistry are designed around the new science curriculum, and make it much easier to set up simulations. Each kit deals with a particular topic from the science curriculum. In each lesson kit folder, you’ll find a starter model. This is a ready-made environment where you can set up the simulation of your experiment. You’ll also find the chemicals and equipment you need, already set up for you, and a set of instructions. Drag them onto the screen and your simulation is ready to go. These lesson kits are ideal for presenting in front of a class using a whiteboard - as well as letting students create their own models. The lesson kit folder holds all the chemicals and glassware you need. The starter model has graphs, backgrounds and parameters already set up, too. You’re free to concentrate on teaching. Bright graphics and clear animations help to illustrate the topics, revealing hidden concepts. The display is fully customisable and every part can be moved and edited to suit your needs. 3D animations of atoms and molecules are linked to the simulation, helping you illustrate reaction mechanisms, and processes like crystallisation or boiling. There’s also a whiteboard mode, to display the simulation full-screen and hide the toolbars. Crocodile Chemistry offers much more flexibility than other science software. It's not just a library of animations - it's a full and flexible simulated lab. The new lesson kits make set-up easier, but you’re still free to edit amounts and concentrations, and combine chemicals as you wish. This means you can teach in your own way, and respond flexibly to questions from your students. You can set up the experiments exactly as you wish. For example, set the exact concentration of a solution, or choose whether to use a coarse or fine powder. This flexibility means that you'll never exhaust Crocodile Chemistry's capabilities. You can change parameters to help you illustrate different reactions, the effects of changing conditions, the role of energy in chemistry - and much much more. It also helps with differentiation - for example, when you're looking to extend more able students, or simplify topics for younger pupils. With the new lesson kits, though, you only change settings when you want to; you don’t need to build the whole model from scratch. Then, when you're comfortable with how the software works, you can start to tinker with the simulation parameters. 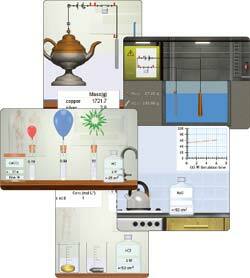 The lesson kits also offer new contexts for your simulations, like a factory or a kitchen. The powerful graph tool will now plot any quantity on either axis - for example, pH against volume. It’s easy to set up, though - add the graph, drag a target symbol onto your chosen vessel, and choose what to plot. Graphs are plotted in real-time, sitting alongside the animated graphics on-screen. Also, each vessel has an information window, which shows reactions, masses, concentrations and physical properties - changnig as the simulation runs. You can customise how this is displayed, to suit it to the needs of your class.